MED-EL Cochlear Implant Systems are intended to evoke auditory sensations via electrical stimulation of the auditory pathways for individuals with severe-to-profound sensorineural hearing loss who obtain little or no benefit from acoustic amplification (traditional hearing aids) in the best aided condition. The cochlear implant system consists of an implant, which is surgically placed under the skin behind the ear, and an audio processor which is typically worn on the ear. Cochlear implantation is a prescription treatment; if you believe you are a potential candidate, contact your physician or hearing healthcare center for a pre-operative assessment according to the local professional standards. Certain medical conditions, including an absent or non-functioning auditory nerve pathway, inner ear malformations, middle ear infection, cranial malformation and allergies to the implant or audio processor materials constitute contraindications. Expected performance with cochlear implants cannot be accurately predicted. To obtain the optimal benefit from the implant, the prospective implant users and their families must be highly motivated and have realistic expectations about the expected benefit of the implant and must understand the importance of returning to the implant center for regular audio processor programming, assessment sessions and training. The adjustment to a cochlear implant and adequate fitting of the device are gradual processes that occur over time. Please talk with your physician about any particular risks related to implant use, surgery, and/or general anesthesia that might apply to your specific situation. Cochlear implant surgery is comparable to middle ear surgery with additional access to the inner ear. The normal risks of surgery and general anaesthesia are applicable. Primary surgical risks include the following: infection, inflammation, swelling, necrosis, haematoma, leakage of cerebrospinal fluid (CSF), damage to the facial nerve, pain, scarring of the wound, skin irritation, swallowing difficulties and complications related to general anesthesia. Additionally, meningitis can be a rare postoperative complication, but has the potential to be serious. The risk of meningitis may be reduced, for example by vaccination, antibiotic cover, and surgical technique. Possible post-operative side-effects include the following: loss of residual hearing, dizziness, increased vertigo, delay of healing of the scar, impairment of the sense of taste, potential for swallowing difficulties, numbness, increased tinnitus, stimulation of the facial nerve, temporary pain and uncomfortable sounds during stimulation. There is also a possibility of post-operative device failure or a decrease in device performance. Some post-operative complications may require revision surgery. The implant package and the electrodes are located directly under the skin. In order to avoid damage to the implant you/your child should not unnecessarily move and extensively scratch the skin above the implant site and should also avoid mechanical pressure on the site. When brushing or styling the hair at the site of implantation, you should be careful not to harm the skin (at the site of the implant there may be a slight bulge). A blow to the head may damage the implant and result in its failure. Implant recipients are strongly encouraged to use head protection whenever possible during sports and activities in which head trauma is a risk (e.g. bicycling, motorcycling, skiing) and should never participate in sports in which head trauma is part of the activity (e.g. boxing). Consult with your physician before snorkeling or scuba diving. Children shall be instructed not to swallow or put any components of their Cochlear Implant System into their mouths and not to play with any components. For young children, it is mandatory to use the safety lock to prevent them from disassembling the audio processor. If you plan to enter an environment that could potentially adversely affect the operation of your Cochlear Implant System (e.g. an area that is protected by a warning notice preventing entry by patients fitted with a pacemaker) it is advisable to first contact your clinic or MED-EL. Care should be taken with the external components of the cochlear implant system. They should not be dropped or subjected to dangerous areas (machines or high voltage) which could result in damage to the components. Infections in the implanted ear must be treated promptly by a physician who will prescribe antibiotics as necessary. In rare cases, audio processors may interfere with reception when using certain TV sets (sets with an indoor antenna). Mobile phones and other portable and mobile RF communications equipment may interfere (perceived as a buzzing sound) with the external parts of the MED-EL Cochlear Implant System if they are used within a distance of less than 9.84 feet. The audio processor should never be connected directly to any equipment connected to an electrical outlet of any kind, including a power strip. Galvanic isolation systems, such as an infrared system or FM system, should always be used if you want to connect to a device that plugs into an electrical outlet. Battery operated devices can be directly connected to the audio processor. Special cables may be needed (e.g. for connection to FM systems). For further information please contact MED-EL. Electronic devices are influenced by electrostatic discharge (ESD). Although the MED-EL Cochlear Implant System has several internal safety features designed to reduce ESD, there is a small risk that the external or internal equipment can be damaged if the static discharge flows through the external equipment. Only 0.2T MRI scanners should be used on patients who have MED EL C40+ implants. There is no need to remove your implant’s internal magnet, but you should always remove your audio processor before undergoing a MRI scan. Unlike other tube-like MRI scanners, the open MRI machines have a clear, unobstructed space on one or more sides allowing patients to see and talk to imaging personnel and loved ones during the exam. If you have difficulty locating 0.2T MRI scanners, MED EL can provide a list of scanners and their locations. MED-EL must be consulted prior to conducting a 0.2T MRI examination on any patient with a MED-EL C40+ Implant. Do not, under any circumstances, scan a MED-EL C40+ patient with field strengths greater than 0.2T. When scanning at 0.2T, confirm that the patient is positioned so that the magnetic field of the internal magnet is in the same orientation as the magnetic field of the scanner. This is necessary to minimize torque on the internal magnet and induced voltage in the receiver. Straight orientation of the head is acceptable for bilaterally implanted patients. Please note that there exist many types of 0.2T MRI scanners. In some, the head coil used for head imaging is attached to the MRI bed. Further counseling and recommendations will be provided to the cochlear implant professional and radiologist in the event of head imaging. MED-EL has prepared an MRI Examination Request Form containing precise information on device parameters (magnetic field strengths) and guidelines for an MRI examination under safe conditions. The MRI Examination Request Form must be completed by the requesting physician in cooperation with the applicable radiology department and reviewed and approved by MED-EL prior to performing the MRI examination with a MED-EL C40+ implant for safety reasons and to avoid loss of warranty coverage. External equipment should not enter or be in close proximity to the MRI machine. The external components of the MED-EL cochlear implant system (audio processor and accessories) are MR Unsafe and need to be removed prior to scanning. The implanted components of the MED-EL cochlear implant system are MR Conditional. Bone thickness underneath the implant magnet of at least 0.4 mm. Bone thickness must be determined using CT images. Before patients enter any MRI room, all external components of the implant system (audio processor and accessories) must be removed. The implant is not damaged mechanically, electrically or in any other way. Large image artifacts are to be expected. The size and shape of the image artifacts depend on the MRI sequence. The artifacts extend approximately 10 cm (3.9'') in radius around the device in a Spin Echo scan (refer to Figure 2). A supportive head bandage must be placed over the implant before entering the scanner room. This may be an elastic bandage wrapped tightly around the head at least three times (refer to Figure 1). The bandage needs to fit tightly but should not cause pain. Head orientation: In the case of 1.5 T systems, the longitudinal axis of the head must be parallel to the main magnetic field of the scanner. For example this is the case when the patient is in a supine position with the head kept straight. The patient should not turn or bend his/her head to the side; otherwise partial demagnetization of the implant magnet is possible. During the scan, patients might perceive auditory sensations such as clicking or beeping. Adequate counseling of the patient is advised prior to performing the MRI. The likelihood and intensity of auditory sensations can be reduced by selecting sequences with lower specific absorption rate (SAR) and slower gradient slew rates. The above instructions should also be followed if areas of the body other than the head are to be examined (e.g. knee, etc.). When lower extremities are to be examined, it is recommended that the patient's legs are positioned in the scanner first to minimize any risk of weakening the implant magnet. In non-clinical testing and electromagnetic in-vivo computer simulations, the implant produced a maximum temperature rise <2 °C during 15 minutes of continuous MR scanning in the Normal Operating Mode at a maximum whole-body averaged SAR of 2.0 W/kg and a maximum head averaged SAR of 3.2 W/kg. Figure 1: Head bandage to support fixation of the implant. 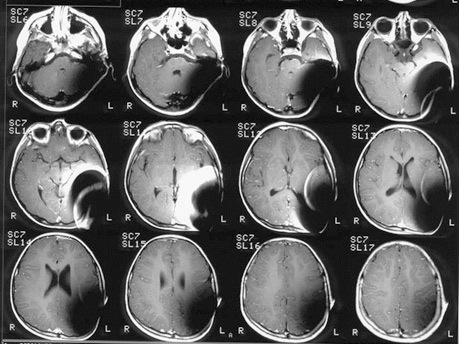 Figure 2: MR images obtained with a 1.5 T scanner (8 year old child). The external components of the SYNCHRONY Cochlear Implant System (audio processor and accessories) are MR Unsafe and need to be removed prior to scanning. The implant components of the SYNCHRONY Cochlear Implant System are MR Conditional. Patients implanted with a SYNCHRONY Cochlear Implant may be safely scanned with an MRI system without surgical removal of the internal magnet when adhering to the conditions for safe scanning listed below. The implant has a specially designed magnet which allows safe MRI scanning with the magnet in place, and there is no need to remove the implant magnet. The implant magnet can be surgically removed if needed to avoid imaging artifacts. The physician/MRI operator should always be informed that a patient is a cochlear implant user and that the conditions for safe scanning below must be followed. Sequences in Normal Operating Mode only with a maximum head specific absorption rate (SAR) of 3.2 W/kg. For head scans and scans with a landmark location that is less than 35 cm from the top of the head the MR system must be able to provide an SAR limit prediction that allows fractional SAR display. a. For head scans: Maximum average head SAR must not exceed 1.6 W/kg (50 % of maximum head SAR). b. For landmark locations less than 35 cm from the top of the head: Maximum whole body SAR must not exceed 1.0 W/kg. c. For landmark locations at least 35 cm away from the top of the head: Maximum whole body SAR must not exceed 2.0 W/kg. Table 1: Specific Absorption Rate (SAR levels). For 1.5 T scans under the conditions listed above, the implant is expected to produce a maximum temperature rise of less than 2 °C during 15 minutes of continuous MR scanning. For 3 T scans under the conditions listed above, the implant is expected to produce a maximum temperature rise of less than 3 °C during 15 minutes of continuous MR scanning. Before patients enter any MRI room, all external components of the implant system (audio processor and accessories) must be removed from the head. Head transmit coils or multichannel transmit coils must not be used with a 3 T MR system. The patient should be lying on his/her back with the head aligned parallel to the long axis of the scanner. The head should not be tilted more than 30 degrees from the axis of the scanner. The patient should be advised to not tilt his/her head to the side; otherwise torque is exerted onto the implant magnet which might cause pain. For scans requiring a head coil, the head coil will maintain a proper head orientation. For scans without a head coil, appropriate padding that will prevent the head from tilting more than 30 degrees must be used. Testing has demonstrated that migration or magnet displacement will not occur when scanned using these conditions. 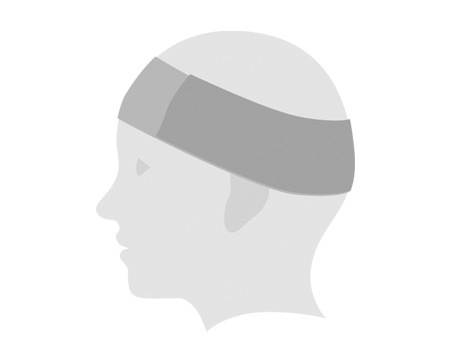 For field strengths of 1.5 T and 3 T, an optional supportive head bandage may be placed over the implant, for instance using an elastic bandage wrapped tightly around the head at least three times (refer to Fig. 1). The bandage shall fit tightly but should not cause pain. The implant must not be damaged mechanically, electrically or in any other way. In case of additional implants, e.g. a hearing implant in the other ear: MRI safety guidelines for this additional implant must be met. During the scan patients might perceive auditory sensations such as clicking or beeping. Adequate counseling of the patient is advised prior to performing the MRI. The likelihood and intensity of auditory sensations can be reduced by selecting sequences with lower specific absorption rate (SAR) and slower gradient slew rates. The magnet can be removed to reduce image artifacts. If the magnet is not removed, image artifacts are to be expected (refer to Fig. 2 and Fig. 3). The artifacts extend approximately 10 cm (3.9'') in radius around the device in a Spin Echo scan. Figure 2: Image artifacts of a spin echo sequence in axial view arising in a 1.5 T scanner. The left picture shows the artifacts obtained with the implant magnet in place whereas the right picture illustrates the image artifacts when the implant magnet is replaced with the Non-Magnetic Spacer. Figure 3: Image artifacts of a spin echo sequence in axial view arising in a 3 T scanner. The left picture shows the artifacts obtained with the implant magnet in place whereas the right picture illustrates the image artifacts when the implant magnet is replaced with the Non-Magnetic Spacer. The exchange of the magnets with the Non-Magnetic Spacer and vice versa has been tested for at least five repetitions. The above instructions should also be followed if areas of the body other than the head are to be examined (e.g. knee, etc.). When lower extremities are to be examined, it is recommended that the patient's legs are positioned in the scanner first. If the conditions for safe scanning listed above are not followed, injury to the patient and/or damage to the implant may result! Patients implanted with a SYNCHRONY PIN Cochlear Implant may be safely scanned with an MRI system without surgical removal of the internal magnet when adhering to the conditions for safe scanning listed below. The implant has a specially designed magnet which allows safe MRI scanning with the magnet in place, and there is no need to remove the implant magnet. The implant magnet can be surgically removed if needed to avoid imaging artifacts. The physician/MRI operator should always be informed that a patient is a cochlear implant user and that the conditions for safe scanning below must be followed. Head orientation: In case of 1.5 T systems, the longitudinal axis of the head must be parallel to the main magnetic field of the scanner. For example this is the case when the patient is in a supine position with the head kept straight. The patient should not turn or bend his/her head to the side; otherwise partial demagnetization of the implant magnet is possible. MED-EL cochlear implants are MR conditional devices. Individuals implanted with a MED-EL cochlear implant may be safely scanned with MRI only under very specific conditions. Scanning under different conditions may result in severe patient injury or device malfunction. The external components of the MED-EL cochlear implant system are MR unsafe and must be removed prior to scanning. For implant specific Magnetic Resonance Imaging (MRI) safety information, please see the Medical Procedures Manual links below. For SYNCHRONY, testing has demonstrated that migration or magnet displacement will not occur when scanned under the conditions listed in the Medical Procedures Manual. For field strengths of 1.5T and 3.0T, a supportive head bandage is optional, but not required. This manual provides important instructions and safety information for MED-EL Implant System users who have to undergo a medical procedure (e.g. MRI). As an implant user, you might have questions about undergoing further medical proce- dures. Your medical team may also want more information about any special consid- erations for implant users. This guidance provides information that will help prevent damage to your implant and injury to yourself. Please share this information with your healthcare provider. The “MRI Checklist for professionals” contains excerpts of product labeling relevant for MRI examinations. It may be helpful when planning and performing an MRI as it lists tasks to be completed in chronological order.